We’ve had a busy, busy summer. It all started with a new grand baby, and then mom and dad getting new jobs 2 1/2 hours away (boo! but happy for them). Top that off with them buying a house and moving. Oh, and did I mention we all went on a family vacation to Florida in the middle of it all. Yes, the new one, too, along with 3 other grands 5 and under and their parents and one Aunt K. My husband and I were right in there with it all. : ) Things were just beginning to settle down when my husband came down with shingles, which really knocked him for a loop for a while. Needless to say, our healthy eating plan took a nose dive. My other daughter-in-law introduced us to the meals in a box delivery. We tried Hello Fresh. I will say, I loved that idea. We tried it out. It was so much fun when a new shipment arrived. We loved most of the meals. There was quite a bit of preparation for a meal, but it was fun. We felt like chefs. It was so organized and the instructions so well written, that everything magically came together at the end. My husband actually cooked most of the meals. I also loved the way each meal ingredients were boxed separately. My daughter-in-law just tried out another one and everything was all mixed together. I wasn’t too impressed with that. But……back to eating healthy. As much fun as the boxed delivery meals were, they really had a lot of carbs and were not as healthy as we need. We had done Whole 30 and were well on our way to Paleo cooking when we hit our food roadblock. I am proud to say, though, I haven’t had a soda since April 6. Yay for me! So now, it is back to thinking healthy again. First up, tonight I’m going to one of those make it and take it things. 20 Paleo meals for two for the freezer. This includes meat, veggies, and all ingredients. We just put it together and pack it home for the freezer. While assembling our meals, they will provide wine and appetizers. You can’t go wrong there. Wouldn’t it be nice if it included those handy, dandy recipe cards? I’ve been to these types of things before, and I don’t think they will have these. Darn. Hey, here’s an idea. My husband and I will create our own cards. We can sell them to the person doing these meals. I can just envision the photo shoot now. Can anyone say “The Swedish Chef”? Wait, he’s more Norwegian than Swedish, but I’m sure he could do the accent. Anyway, I can’t wait to do this…. a fun night! 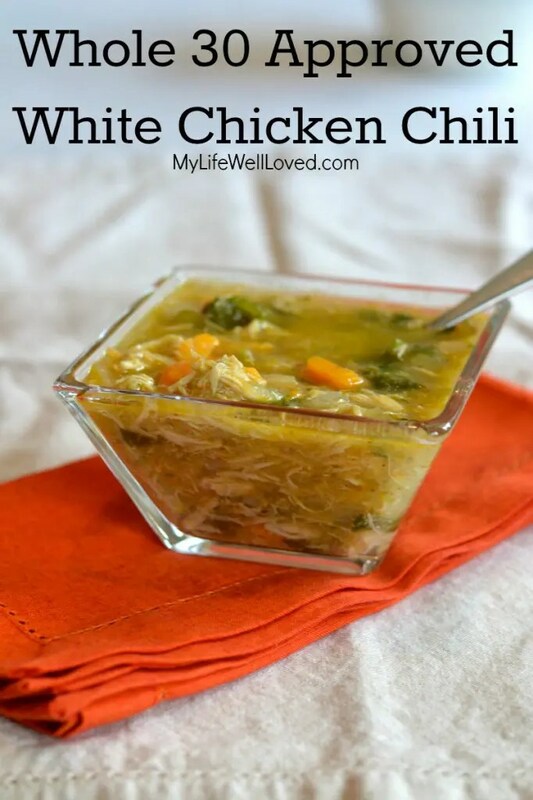 My first whole30/paleo meal (with back to healthy eating kicking in) was White Chicken Chili, a recipe I found online. It was very, very good. It was also pretty quick and easy as you used a rotisserie chicken. I went with boxed broth instead of making my own. I also added some celery to the onion and bell pepper saute. There are other veggies you could add, too. I’m thinking next time, I will add some spinach. After falling off the healthy eating wagon, we are ready to climb back on and start cooking and enjoying a healthy eating lifestyle again.